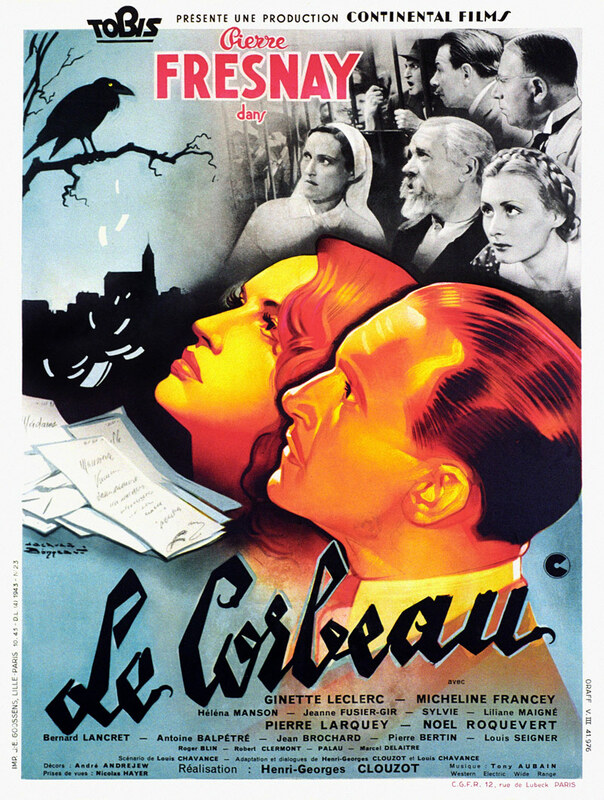 LE CORBEAU is a 1943 French language film directed by Henri-Georges Clouzot. The film was notable for causing serious trouble for its director after World War II, because it had been produced by Continental Films, a German production company established in France in the early months of the war and because the film had been perceived, by the underground and the communist press, as vilifying the French people. In a small French town identified as 'anywhere', anonymous letters are sent by somebody signed as Le Corbeau (the Raven). The letters start by accusing doctor Rémy Germain (Pierre Fresnay) of having an affair with Laura Vorzet (Micheline Francey), the pretty young wife of the psychiatrist of the hospital, the old Dr. Vorzet (Pierre Larquey). Germain is also accused of practicing illegal abortions. Letters are then sent to virtually all the population of the town, but keep getting back at the initial victime, Dr Germain. The situation becomes serious when a patient of the hospital commits suicide with his straight razor after receiving a letter that falsely informs him about his condition being terminal. Marie Corbin, a nurse in the infirmary, becomes suspect and is arrested, but soon new letters arrive. (92 mins. Very good quality; in French with English subtitles). TOUCHEZ PAS AU GRISBI: Max, an old gangster, and his buddy Riton have gotten away with 50-million francs in gold bars, and he thinks they ought to retire now. But Riton's girl-friend is tired of him, and has a new protector, Angelo, who is the boss of a rival gang. Through her, Angelo learns about his rival's "grisbi" (loot) and plots to get it. So he kidnaps Max's partner. Max asks some of his friends for help but then gets the message he can exchange the money for his partner. (94 mins. Very good quality; in French with English subtitles). DVD-R IS APPROX. 186 MINS. TOTAL. VERY GOOD FILM QUALITY.